A fishing rod is a device used in sport fishing that consists of a long pole with a line held in place alongside it with the use of guides. Usually the line is kept in storage on a reel that the angler spins to both take up and let out the line while casting. At the loose end of the line is a hook to hold the bait, either live worms and insects or artificial lures, as well as bobbers (or floats) and sinkers that keep the bait at the proper level in the water. Ever since humans began gathering foods, the living creatures in water have been considered possible sources of nutrition, and many ways were devised to catch a sufficient number of fish in a simple fashion. Nets and weirs, which are dams often woven from reeds and placed in streams, were both used to gather a great number of fish, which could then be sorted into edible and undesirable fish. The very earliest rods were made of wood, bone, or stone and were called gorges. These gorges were only about 1 in (2.54 cm) long and were pointed at both ends. A bait and line were attached to these gorges, which soon were made of metal. Fishers would use gorges to fish from boats. Longer rods began to be used soon after, at first just a simple tree branch about a yard (0.9 m) long, and anglers could then fish from shore with ease. Pictures of angling show it as an accepted sport in ancient Egypt around 2000 B.C. A Chinese written account from around the fourth century B.C. 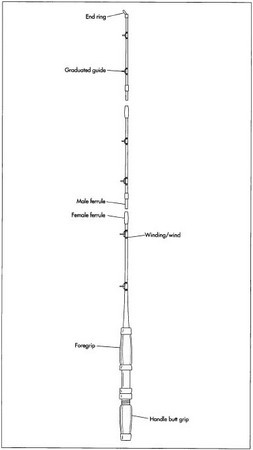 describes a bamboo rod, with a silk line, a needle used as a hook, and rice as bait. In ancient Greece and Rome, fishing with a rod was already a common activity. In Homer's time, or around 900 B.C. , and in Plato's time, or around 400 B.C. , fishing with a barbed hook, rod and line were known. The line was made from either horsehair or finely woven flax. The rod is believed to have been made from Arundo donax, a plant native to the Mediterranean area and the largest of European reeds. It grows up to 20-30 ft (6.1-9.1 m) long, and it is knotted. A plant known as ferula might have been the source for smaller rods, but cornel wood, a slender hardwood, or juniper might also have been used. The rod was jointed, either by tying the parts together with string, or tiny pieces of metal known today as ferrules could have been used. The bronze hook was not tied on; rather, the top of the hook extended over the string in a sheath to keep fish from biting through the line. Sometimes a piece of lead was attached to the hook to ensure depth, while fly fishing quickly developed when it was learned that some kinds of fish would eat flies off the surface of the water. The bait used in fly fishing was a piece of red wool with rooster feathers attached. The feathers presumably appeared as a waxy color to the fish, hence resembling fly's wings, and they helped keep the bait afloat. Anglers had no running tackle—they had to pull the line in using force. Angling captured the imagination of Greek and Roman scholars. Plutarch wrote that a good rod must be slender and springy, because a heavy rod would cast a shadow and scare the fish. The line must not have knots or be coarse, and it should be white so as to match the color of the water. Dionysius wrote that an angler with two rods, four hooks apiece, and an assistant could catch more fish than a net, if good bait is used. Fishing rods changed only slightly for more than a thousand years. In England in 1496, a nun named Dame Juliana Berners wrote The Treatyse of Fysshynge wyth an Angle. This book described artificial flies, some of which are still used today, and rods 18-22 ft (5.5-6.7 m) long with lines made of horsehair. During the middle of the seventeenth century, the fishing rod was greatly improved by adding a wire loop or ring at the tip. This allowed the line to be let out and pulled in easily. Lines at least 26 yd (23.8 m) long were mentioned by 1667. Such lengthy lines led to the development of the reel. The first reels were wooden spools with a metal ring which fitted over the fisher's thumb. By 1770, fishing rods with guides along the length and reels were in common use. Fishing rods were improved during this period by replacing heavy European woods with tough, elastic woods, such as lance-wood and greenheart, both from the New World. Bamboo from the East was also used. By the late nineteenth century, hexagonal fishing rods were made by laminating six triangular strips of bamboo. At the same time, reels were greatly improved. Horsehair lines were replaced by silk coated with oxidized linseed oil. During the twentieth century, fishing rods became shorter and lighter without losing strength. Bamboo was replaced by fiberglass or carbon fiber. Nylon became the dominant material for use in fishing lines after World War II, and plastic became used to make artificial flies. Fishing became an increasingly popular sport in the late twentieth century. Thirty-one million fishing licenses were sold in the United States in 1992, compared to 20 million in 1959. Although some fishing rods are still made of bamboo, most modern rods are made of fiberglass or carbon fiber. The ferrules, which hold the portions of the rod together, are made of metal or fiberglass. The grips on fishing rods are usually made of cork, but are sometimes made of plastic, wood, or cloth. Reel seats are made of aluminum or other metals or plastic. Guides are made of chrome-plated brass or tungsten carbide and an alloy called nickel silver. Fishing rods consist of tubular sections, known as blanks, and various smaller components attached to them. Blanks are sometimes made of bamboo, but most blanks are made from strong, flexible fibers, such as fiberglass or carbon fiber. 1 Bamboo is shipped to the fishing rod manufacturer in the form of hollow canes about 6-8 ft (1.8-2.4 m) long and about 1.25-2 in (3.2-5.1 cm) wide. The canes are split in half lengthwise with a heavy knife or a cutting machine. The interior of the split cane contains thin partitions spaced about 15-18 in (38.1-45.7 cm) apart. These natural partitions occur at the points where leaves emerge from the bamboo plant. They are removed with a chisel or cutting tool. The bamboo may then be heated briefly to harden it. Some makers of bamboo blanks soak the bamboo with a liquid plastic resin to strengthen it and to make it waterproof. 2 Precision cutting tools cut the bamboo into long strips. An accuracy of about one one-thousandth of an inch (0.03 mm) in the width of the strips is necessary to ensure that the strips will fit together properly. Six strips are usually used to make a hexagonal blank. Some manufacturers use five strips to make a pentagonal blank. The strips are glued together under heavy pressure. Strong thread is wrapped around the strips to maintain pressure at the points where they meet. The glue is allowed to dry, the string is removed, and the blank is lightly sanded to remove excess glue and to provide a smooth surface. mixture is melted into a liquid in a furnace to form molten glass. The molten glass is then forced through a steel device containing numerous small holes known as spinnerets. The emerging glass cools into fibers, which are spun into yarn. The yarn is then woven into sheets. 4 Carbon fiber is derived from various synthetic fibers. These fibers are polymers, which consist of long chains of molecules which contain numerous carbon atoms. Carbon fiber can be made from rayon, a synthetic fiber derived from cellulose, a natural polymer found in plants. It can also be made from acrylic, a synthetic fiber derived from an artificial polymer of acrylonitrile molecules, which are obtained indirectly from petroleum. The synthetic fiber is heated, forcing out atoms other than carbon, resulting in long chains of carbon atoms. (If the fiber is heated too strongly, the carbon atoms will form sheets instead of chains, resulting in graphite.) The carbon fiber is spun into yarn, which is woven into sheets. 5 The fiberglass or carbon fiber sheet is dipped into a solution of liquid plastic resin, then squeezed between metal rollers to leave a controlled amount of resin in the sheet. The sheet is then heated to remove excess solvent and to partially harden the resin until it is slightly sticky. A metal template is laid on top of a stack of sheets. A sharp blade cuts around the template, producing several cut sheets of the same shape. The exact shape varies with the type of rod being made, but generally resembles a tapering rectangle. 6 One edge of the cut sheet is heated in order to attach it to a tapered steel rod known as a mandrel. The sheet is oriented so that the majority of the fibers line up along the length of the mandrel, with about one-tenth to one-sixth of the fibers at right angles to the rest. 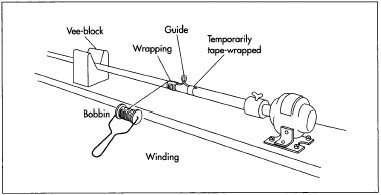 The mandrel is rolled between two heated metal rollers, known as platens, that apply pressure as layers of fiber are wrapped around the mandrel. A thin film of a synthetic polymer, such as cellophane or polyester, is wrapped around the layers of fiber. 7 The wrapped mandrel is heated in an oven to about 300-350° F (150-180° C) for about 30-60 minutes. The heat causes the polymer film to shrink, applying pressure to the fiber as the resin hardens. The mandrel is removed from the hardened fiber by using a pressurized ram to force it through a die. The polymer film is removed using a wire brush, a tumbler, high-pressure steam, splitting, or stripping. The blank is lightly sanded to remove excess resin and to provide a smooth surface. It is then coated with layers of various protective materials. The blank is buffed between each coating to give it a smooth finish. 8 Most fishing rods are made up of two or three blanks, allowing the rod to be disassembled for ease in storage and transportation. Usually the blanks are attached together with connectors known as ferrules. Ferrules are made from metal or fiberglass, and are attached to the ends of the blanks with strong cement. 9 Grips for the handles of fishing rods are made from natural cork, obtained from the outer bark of certain evergreen oak trees found in Mediterranean regions. They may also be made from synthetic foam rubber. The grip is attached to the end of the blank with epoxy glue. 10 Guides are small rings which are attached along the length of a fishing rod in order to control the line during casting. They also distribute the stress of the line evenly on the rod. The guides are made by cutting and bending wires of steel or chrome-plated brass. They made also be made from a combination of tungsten carbide and nickel silver. The guide is taped into position on the blank. Nylon thread is wrapped around the base of the guide to secure it in place. The wound thread is then coated with lacquer or varnish. 11 A reel seat is the part of a fishing rod to which a steel reel, containing nylon fishing line, can be attached. Reel seats are made from aluminum, chrome-plated brass, or plastic, then attached to blanks. 12 The fishing rod is packaged and shipped to retailers. The consumer assembles the fishing rod, attaches a reel, and threads the line from the reel through the guides. Modern fishing rods are made using fiberglass or carbon fiber sheets. Coated with liquid plastic resin, the sheets are attached at one end of a steel rod called a mandrel. The mandrel is rolled between two heated metal rollers, known as platens, that apply pressure as layers of fiber are wrapped around the mandrel. The wrapped mandrel is heated, causing the resin to harden. Next, a pressurized ram removes the mandrel from the hardened fiber blank. The blank is lightly sanded to remove excess resin and to provide a smooth surface. It is then coated with layers of various protective materials. The blank is buffed between each coating to give it a smooth finish. Testing of a fishing rod begins soon after a new design is developed. A prototype of the new product is manufactured and used to catch fish in a variety of outdoor conditions. The design is altered as necessary, and the process is repeated until the new design meets its desired goals. 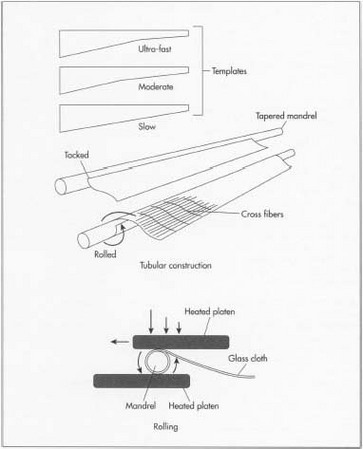 During the manufacture of the blank, the pressure applied to the fiber sheet as it is wrapped around the mandrel must be uniform, or the rod will be uneven. Protective finishings applied to the blank must be even and not too thick, or the rod will not function correctly. During the assembly process, all the parts must fit together correctly. Ferrules must be lined up correctly and must have the proper dimensions to allow the fishing rod to be assembled easily without being too loose. Guides must be spaced the correct distance apart. If they are too far apart, the line will sag. If they are too close together, the line will not move smoothly. Manufacturers of fishing rods are constantly developing new products which enable consumers to cast lines farther and more accurately. Most fishing rods are made up of two or three blanks, allowing the rod to be disassembled for ease in storage and transportation. Usually the blanks are attached together with connectors known as ferrules. Ferrules are made from metal or fiberglass, and are attached to the ends of the blanks with strong cement. Guides are small rings which are attached along the length of a fishing rod in order to control the line during casting. The guides are made by cutting and bending wires of steel or chrome-plated brass. Nylon thread is wrapped around the base of the guide to secure it in place. The wound thread is then coated with lacquer or varnish. The future is likely to see this trend continue. Fishing rods are also likely to become more and more specialized, with each rod designed to catch fish of a certain weight. A recent development suggests that fishing rods may be very different in the near future. The Interline fishing rod, manufactured by Daiwa, has no guides. Instead, the line runs through the center of the rod and emerges from its tip. This revolutionary design avoids the common problems of broken guides and lines tangled in guides. Gorant, Jim. "The Guideless Rod." Popular Mechanics (October 1997): 40-42. Merwin, John, and Ken Schultz. "A Century of Piscatorial Progress." Field and Stream (October 1995): 38-41. Pfeiffer, C. Boyd. "Fishing Rod Repair." Outdoor Life (June/July 1997): 128-129. How are line and lure weight computed for the different types of rods, spinning or casting? I haven't been able to find this information anywhere and am beginning to think it is all subjective or imperical. All the rods I've looked at have this information and I was wondering how its figured. I have a two piece 12ft rod and the blanks are stuck together. I tried cold weather to shrink them to remove but will not budge. Does anyone have and suggestions to remove the blanks, I would appreciate it!!!! What happens when the fishing rod has to be thrown away because its not usuable anymore? Are some of the parts saved and re-used, or is it all just thrown away? where can i find the line guide and tip top for inter line fishing rods?